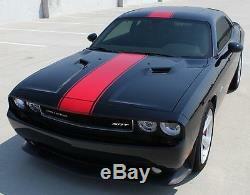 11-14 Dodge Challenger New Finish Line Vinyl Stripe Graphic Kit. SE1889 (with Spoiler / with XM). SE1890 (with Spoiler / no XM). SE1891 (no Spoiler / with XM). SE1892 (no Spoiler / no XM). This is exceptionally engineered 3M, Ritrama or Avery, high performance, 2 mil cast vinyl with permanent acrylic, pressure sensitive adhesive for the most demanding OEM automotive standards. This is'the best' in the industry. These stripes have unmatched quality and are perfect for outdoor durability on all auto, RV and marine applications. We have a wide variety of size and color choices available in various configurations. 5 to 7 years Extend the life of your vinyl with once a month applications of 303 Aerospace Protectant. Application is best if applied in temperatures between 55 and 85 degrees fahrenheit 1. All adhesive applications must be applied to a clean surface, free of all wax, oil and grease(see our installation supplies for cleaner). Remove back paper liner exposing adhesive. Position striping, being careful not to stretch the vinyl. Lay striping onto the application surface, then go over the entire surface gently with an application squeegee to ensure bond. Carefully remove the protective premask by pulling parallel with the stripe immediately after application. To assure a permanent bond please allow at least 72 hours in direct sunlight before washing or waxing. Having been in the auto graphics industry since the mid 80's we consider ourselves experts in the field of vinyl. Please see our FAQ section for details on the difference between high performance(cast) and intermediate(calendured) material as well as links for your own research. The details may surprise you. Trying to match a stripe? Professional marine and auto repair shops and the finicky do-it-yourselfers and sports enthusiasts demand high performance 3M, Avery & Ritrama. Note: Don't be fooled if the other guys are advertising 3M for cheap as 3M, Avery and Ritrama all have an intermediate line of products. In this case, you get what you pay for. We at Stripeman Graphix only use High Performance for our vehicle graphics and stripes while saving the intermediate material for customers looking for an inexpensive option for very temporary banners and yard signs. Are you in the Jacksonville, Florida area? Have our professional and 3M Preferred installers install your stripes, graphics and vehicle wraps, etc. At our 10,000 + square foot facility. Free WiFi and/or television in our air conditioned lobby while you wait for smaller stripe and graphic installs. Professional Grade Graphics by Seasoned Pros. Check out my other items. Be sure to add me to your favorites list. 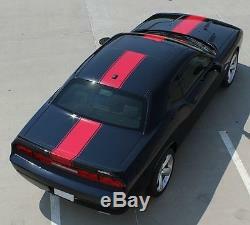 The item "11-14 Dodge Challenger New Finish Line Vinyl Stripe Graphic Kit" is in sale since Monday, January 11, 2016. This item is in the category "eBay Motors\Parts & Accessories\Car & Truck Parts\Decals/Emblems/License Frames\Decals & Stickers\Graphics Decals". The seller is "stripemangraphixinc" and is located in Wichita, Kansas. This item can be shipped worldwide.